New Feature! Check out our AMASS application! 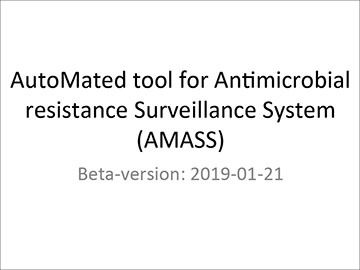 AutoMated tool for Antimicrobial resistance Surveillance System (AMASS) is an offline, open-access and easy-to-use application that allows a hospital to perform data analysis independently and generate isolate-based and sample-based surveillance reports stratified by infection origin from routinely collected electronic databases. AutoMated tool for Antimicrobial resistance Surveillance System (AMASS) was developed as an offline, open-access and easy-to-use application that allows a hospital to perform data analysis independently and generate isolate-based and sample-based surveillance reports stratified by infection origin from routinely collected electronic databases. The application was built in R, which is a free software environment. The application has been placed within a user-friendly interface that only requires the user to double-click on the application icon. AMASS performs data analysis and generates reports automatically. The raw data files required are hospital admission and microbiology databases. The application cleans the raw microbiology database and produces isolate-based and sample-based surveillance reports. The application then merges the microbiology and hospital admission datasets, analyzes the merged data, and produces an AMR surveillance report. The final step is a statistical analysis to estimate all-cause mortality of patients with AMR infection and mortality attributable to AMR, which are automatically added into the surveillance report. To download the AMASS application, please follow the link below. "Modelling for Infectious disease CEnter" (MICE) is a website containing open-access web-based applications that allow researchers to apply complex statistical models to their own data sets via user-friendly interfaces. Our web-based applications do not require users to download or install any programme prior to use. We run models for you. You can just choose the model you would like to use, and input your data set in the form provided on the webpage. Then, the results will be provided on the webpage within timely fashion, and you can also send the results to your email if you would like. NEW! user interface for all imperfect gold standard models (Model 101, 102, 103 and 104) !! We are proud to present our recent publication about our website (MICE). The paper contains detailed descriptions of functionality and production of this website. You can leave your comments or ask questions about the models on our Facebook page. You can also email to us directly at mice@tropmedres.ac Your advices and suggestions are more than welcome. We aim to expand the imperfect gold standard models to include the four-tests in one-population model and the five-tests in one-population model soon. We also aim to expand more models for malaria infection and other diseases.